Alexis Bloom: How would you characterize the Mugabe government at the moment? Trevor Ncube: What's very distinct about the Mugabe regime at the moment is that you have what appears to all intents and purposes to be a regime whose back is against the wall. A regime that has become politically bankrupt. They've painted themselves into a corner and they don't know how to get out of that corner. They're desperate. And in their desperation, they are trying to find scapegoats; they're hitting out at anybody, mostly their citizens, and blaming the Americans and the British for the problems that Zimbabwe currently experiences. It's a terrible place, Zimbabwe, at the moment. Pity the poor Zimbabweans who find themselves basically imprisoned in their own country, where standards of living have deteriorated quite significantly, particularly over the past six years, as poverty and social destitution have taken root. Tyranny is an everyday thing; people fear for their lives. Their rights have been taken over by the state. It's more than a police state. To some extent, one would say it's got the trimmings of a military dictatorship. There's a preponderance of military or ex-military personnel in senior government positions. Intelligence operators are taking charge of policing and implementation and running of the country. If you recall that only seven years ago, Zimbabwe was one of the best places in southern Africa to be in and that all that I've just outlined has taken place inside six and a half to seven years - it's quite alarming. It's a sad story of what happens when a regime gets so punch drunk with political power and there's nothing to restrain them. It seems to me that the No. 1 priority of the government is to control its own people. Would you say this is a fair statement? There are quite a number of priorities at the present moment. But clearly, holding on to power for power's sake is one of them. Extending the political tenure of the state is one of them. And controlling the thought process of the people, the movement of the people is one of them because of this fear that the citizens are going to cause something - an uprising and so forth. One of the goals is to try to prevent that. One of the paramount concerns of every person in power is that they are making hay while the sun shines. There's tremendous looting that is taking place - looting of state assets, private property, the land - which has been widely reported. Only last week Robert Mugabe started issuing letters to citizens who are his neighbors at his mansion in Harare; he's given them notice that he intends to acquire their homes because they are too close to him and he's concerned about his security. There is no end to that kind of desperation. Why do you think Mugabe is so driven to stay in power? It has gotten to an extent where he's dug himself into this big hole; there's no getting out of this hole. But I think he's also made up his mind that he's not getting out of power; he's made up his mind that he's going to drop dead in office. And I think one of the things that drive him to reach that decision is that he's concerned about what happens if he leaves office, "What's going to happen the morning after?" as I always call it. Is he going to be taken to Geneva, like what has happened to Slobodan Milosevic? Is he going to be called to account for the things he's done? For the matter of more than 20,000 people [who died] in Matabeleland in the 1980s? The abuses that have taken place over the past six years? The media can't go into certain places in Zimbabwe, so we have no idea the extent of the human rights abuses. That element, to me, is quite significant in making him decide that getting out of power is not an option. Also at play is the whole issue of power corrupts, too much power corrupts absolutely. That's the situation with Robert Mugabe. He has created a situation where he and his party and those around him are the only people standing at the present moment. He's bludgeoned everybody into submission. He's created an environment where the creation of an opposition party, and indeed the survival of an opposition political party, becomes a huge challenge. And all that he can do with that power drives his decision-making process. He's arrived at a place where he genuinely and seriously thinks that Zimbabwe can't do without him. And it's easy to arrive at that place where all that you have around you are sycophants. He's killed the media; he has created a situation where people are afraid to express themselves. There's over 4 million Zimbabweans that have run away - literally in exile - people who cannot stand the political situation, the economic situation and the social situation that is in Zimbabwe. And he doesn't care about that; he would rather destroy the country than see a vibrant, democratic country that is providing for the dreams and aspirations of his people. You mentioned exiles, and here we are in Johannesburg. And you're the publisher of a well-respected newspaper here. Why would Robert Mugabe care about what you're up to? It's what you and I are doing now that he doesn't like - the fact that I speak to the world. The fact that my views are sought by a lot of people throughout the world. I speak at conferences and I express my views without fear or favor. It's the kind of thing that Robert Mugabe doesn't want. He is intolerant to views that are contrary to those that he himself holds and expresses. Scholars say in theory that the power of propaganda is such that you end up believing your own lies. But I think in Zimbabwe, we are seeing that actually happening. We are seeing Robert Mugabe telling lies, big lies; and he and his officials end up believing their propaganda. They actually believe that the Americans and the British are out to get them. And they actually believe that people like me are tools and stooges of the Americans and the British. And therefore, lashing out at people like me is yet another way of getting at the Americans and the British, to show the British and the Americans, these puppets of yours - we can make them run. It's like watching a man go crazy and you really don't know what to do with him. You read the kind of things that are coming out of Zimbabwe and say, "Are these people out of their minds? What's the point of destroying your own country? Because you want to make a point to the Americans and the British?" What was known as the breadbasket of southern Africa, a country that exported maize, tobacco, cotton, flowers - you name it - to the whole world, the second-largest producer of tobacco in the world, is now down on its knees because one madman wants to prove a point to the world. As you say, the reports coming out of Zimbabwe are scant; what little information we do get hints at the lunacy. But we don't really know enough about what he's up to, which takes me to the state of the press in Zimbabwe. What's going on with the press? The press has been under siege for a tremendous time now, I would say for over 10 years. It's been getting worse and got to its lowest under Jonathan Moyo, the minister of Information who is no longer the minister of Information. Legislation was put in place, for instance, requiring publishers to license newspapers every two years and where journalists are required to register. In essence, it was introduced as a way of controlling the newspapers because if you can be registered, you can be de-registered. If you can be licensed, you can be de-licensed. And there are certain conditions you have to abide by to continue to hold that license. They can come up with any reason to take away your license. What you now have is that I am the only independent publisher in Zimbabwe with two newspapers, a Sunday newspaper and a weekly business newspaper. The other paper that can be termed independent is now owned by the government reserve bank in partnership with the central intelligence organization, the equivalent of the CIA. The central intelligence organization has also taken over another group of newspapers, two of them. Does the same apply to other media? At the present moment, there is no private television station. There are no private radio stations - all are controlled by the government. And there are laws that prohibit people from owning television and radio stations. It's a huge struggle trying to set up a newspaper, trying to register a newspaper and indeed surviving as a newspaper. You have an environment whereby people don't have the access to media for all intents and purposes. The only story that Zimbabweans know is the story the Zimbabwean government tells. That creates a very sick society that is not vibrant, where there's no marketplace of ideas, no robust debate at all. It is the government's opinion and you take it or leave it. It is a very sad state of affairs indeed. Do reporters today risk their lives? Absolutely. Not just risk their lives; there's certain places that newspapers cannot be sold. There's certain places that we can't send our newspapers because youth militias and other extra-military forces don't allow the newspapers to be sold there. It is a crime for you to be seen holding any one of my newspapers, for instance, in certain rural areas. As you know, if foreign journalists want to go to Zimbabwe, you need to apply well in advance, and there's no guarantee that you'll be allowed to go in. So it's become a closed society. It might sound like an exaggeration, but the difference between Zimbabwe and North Korea, when it comes to media, is not very big at all. You cannot find a foreign journalist operating in Zimbabwe. Local journalists are under threat all the time, threat of being jailed, threat of being dragged into court for various charges that the government comes up with - using the law as a way of harassing journalists. One cannot rule out the fact that there's a deficit of information from the journalists that are currently operating - most of them are actually censoring themselves because they are scared for their lives. Their family members must be leaning on them and saying, "You have to be careful about what you write." What do you say to foreign journalists who express an interest in coming to Zimbabwe ? Zimbabwe is a war zone, and any journalist who doesn't have a thick skin mustn't bother coming to Zimbabwe because it's a tough place. You'll be harassed; you'll be intimidated; you'll be thrown in prison. You'll face trumped-up charges just because you're a journalist. It is not an easy place to work as a foreign journalist. But if there's a journalist in America or anywhere else who's public-spirited or wants to help Zimbabweans fight the good cause they're fighting, then Zimbabwe is the place to be. Explain why, recently, you had your passport taken away from you. I had my passport taken away from me when I visited Zimbabwe in December last year. I flew into Bulawayo, which is the second-largest city in Zimbabwe, to attend my brother's wedding. I was approached by a lady from immigration who asked to see my passport, which I found very odd because she had already seen my passport. She said she needed to check the spelling of my name. When she had looked at my passport, she literally threw the passport back to me. We went out of the airport to my car and as my driver was about to start the car, a young man who was with immigration, with the woman, came looking for me. I said to my wife, "I think that man is looking for us," so we wound down the windows and he said, "Can you come with me?" I said, "What is this all about?" And he said he'd explain it when we're inside. I said, "I can't come with you. Who are you?" At which point, he showed me his card that said he was from the central intelligence organization. I asked him, "Have I committed a crime?" And he said, "No, you haven't. It's about your passport." And I'm now confused. "I've not committed a crime, there's nothing wrong with my passport - so what do you want from me?" And he said, "Oh, you don't want to come with me?" I saw this was getting problematic, so I got out of the car, my wife accompanied me, and we went inside. Right away, he started filling out the form that if you are a foreigner arriving to this country you have to fill in. He goes to the section that says occupation and says to me, "What do you do?" I said, "I'm a newspaper publisher. You don't know me? I mean, who doesn't know me in Zimbabwe?" I laugh about that, at which point he got on the phone and said, "It's him, the newspaper publisher," and said to me, "We've been instructed to impound your passport." Immigration arrived and said, "Sir, you'll have to go into town to be given the reasons why we are impounding your passport." And indeed, the following day I went to find out why my passport had been taken. All they did was to show me a list of 17 names with an instruction that said with immediate effect the passports of the following people must be impounded on sight. We had to go to court because nobody could tell me why my passport had been seized, and the judge ruled in my favor. The judge said my passport should never have been seized; it was illegal and they should return it. The judge instructed them to pay all my legal costs, I got my passport, and we promptly got out of the country because I had a holiday that I was looking forward to. So, up till now, officially or otherwise, I have not been given a reason as why my passport was seized. All I can do is speculate. Why do you think Mugabe wants to take away your Zimbabwean passport? It gets back to the intolerance of the regime - not just intolerance, but the sense that this regime can do things to its own citizens, not explain things and get away with it. A passport is an important document for business travel, for private travel. And any Zimbabwean now is going to think twice before they express themselves on anything because the fear of losing one's passport becomes a way of censoring oneself. Why should I risk losing my passport by criticizing this government, whether or not inside? I think that's the most frightening prospect in all of this. How would you characterize the current legislature in Zimbabwe? Since independence in 1980, we have seen 17 amendments to the Zimbabwean constitution. The 17 amendments that we've seen have been directed at increasing the power of the president, increasing the power of the state. So the state, the government, the president have been expropriating those rights and people's liberties. It rather concludes that he can only extend his political tenure by limiting people's liberties. The legislature itself - parliament - is full of people who cannot see themselves surviving without Robert Mugabe, people of questionable character, who see politics and the ruling party as a way toward self-enrichment. It's in their interests to make sure Robert Mugabe rules for as long as possible. Linked to that is the fact that Robert Mugabe saw the judiciary as an impediment to his grand design of dislocating the whole country. He has been known to get rid of judges who were independent-minded and replacing them with judges that are "yes" men, judges that will rubber-stamp everything that he says. So there is no guarantee that you'll go to a court and that that court is going to look at your case and look at it fairly. There's no rule of law to talk about, just a selective application of the rule of law. It depends on who you are. Are you a friend or an enemy? Are you a member of the ruling party or are you not? Are you a member of the elite or are you not? I've heard people say things like, "Under Smith the laws were bad, but under Mugabe they're worse." You understand why a lot of people feel Zimbabwe was better under Ian Smith than it is at the present moment. I think in all honesty, the situation in Zimbabwe has degenerated to the extent that comparison between Ian Smith and Robert Mugabe becomes fair game. I'm embarrassed to actually admit that. But what's the difference between Ian Smith and Robert Mugabe? I'm saying now that because there are 4 million Zimbabweans who are in exile. There are in excess of 2.5 million Zimbabweans who are in South Africa. Were there that many Zimbabweans during the liberation of Zimbabwe who are outside Zimbabwe during Ian Smith's regime? The extent of poverty that you experience at the present moment - can it not be compared to the extent of social destitution that there was during the Ian Smith regime? Sentiment aside, let's look at what Ian Smith did and let's look at what Robert Mugabe has done. What makes this whole thing criminal is that this is another black man doing this on his own black people. To me, that just worsens the crime. But I could understand Ian Smith as a white man behaving the way he did toward black people. So I think, yeah, to answer your question, the comparison is a legitimate one. In any case, Robert Mugabe has become worse than Ian Smith. How has the Zanu-PF way of doing business affected the Movement for Democratic Change, the MDC [Movement for Democratic Change]? The Zanu PF way of doing things, the Robert Mugabe way of doing things, unfortunately, has permeated the whole society. For me, that's the most frightening thing - the way the Zanu PF thinking has poisoned national thinking. The only way we have known to resolve our differences is through killing, through threats, through intimidation. That's how Zanu PF has operated from day one, 1980. The MDC is a victim of that political culture inasmuch as MDC has been fighting to get rid of Zanu PF. And the interesting thing about the problems that MDC is experiencing now is that they are actually the creation of Zanu PF. Witness the kind of exchanges that have been taking place between the two factions. Its pettiness of insults; its threats, its violence. The whole thing is degenerating into chaos that is endangering lives. Can the MDC get out of this thing? I doubt it. Some of us have always said that the people who were in charge of the MDC were not the people who could be expected to get this nation out of the challenges that it experiences. And indeed, some of us, I in particular, have voiced a series of reservations about Morgan Tsvangirai having what it takes to be the next leader of this country. We can't take away the fact that he's been a brave man who has stood up to Robert Mugabe to challenge him. But beyond that, what does MDC have to offer? What are their policy options? The whole focus has been getting rid of Mugabe. But get rid of Mugabe and then what? Take for instance on land [redistribution]. What is MDC offering? What is different? Nothing. This illustrates the MDC's tactics and its political naíveté. That's why Mugabe has outfoxed them again and again and destroyed them. That doesn't take away from the fact that they operate in a very difficult environment, with real repression, but they went into this needing to be much smarter. Would you say that Mugabe is as much a brilliant strategist as he is a political thug? Robert Mugabe is a very bright man, very streetwise. He has outmaneuvered the Brits, the Americans and the South Africans again and again. They don't know what to do with him. The man understands politics, knows how to manipulate African leaders, render South Africa totally ineffective. They can't give a commitment to the civilized world that they'll stop this chaos in Zimbabwe. At the end of the day, when we study this man and how his mind works, we'll be amazed at how very intelligent this man is, but intelligent in the wrong way, oppressing his own people, killing them, just so Mugabe can survive to another day. Why don't South Africans do something? The South Africans haven't done anything because they understand how he works, and they know that if they order him, he'll react, and [President] Mbeki realizes that to be effective, he must engage with this man, understand where he comes from, because in that way he can influence him, lean on him by understanding his system better. But one would hope you'd realize there is a point where quiet diplomacy is no longer productive. And that's where I depart from the South African position. Why have they behaved in that manner? One is the race issue. Mugabe claims he's solving the race issue. The fact that 70 percent of the land is owned by 1 percent of the population. How can Mbeki stand up to that idea when he faces a similar situation in South Africa? How do you deal with hero worship, a fallen hero like Mugabe, a man the whole continent looked up to, who assisted the South African resistance? How do you tell your father to sit down and shut up? Nobody has been able to do this. In terms of authority, Mugabe would say, "Mbeki, I dealt with your father," with Mandela, "How can you tell me what to do?" That may seem like a small thing, but in African politics it looms large. So these are things that together explain the current paralysis. Mugabe repeatedly says he is not breaking the laws of his country. They show real sophistication in using the law to restrict people. But as Martin Luther King said, there are good and bad laws, and citizens have the right to break bad laws. Fortunately, we live in a world that is civilized. We have a U.N. bill of rights and an African bill of rights, and I think the time has come to say the way Zimbabwe behaves is outside the bounds of what is acceptable. Is Zimbabwe a cautionary tale for the continent? What future do we have as a continent if our leaders behave as Mugabe? What future do we have as a people and generation if we allow dictators like Mugabe to live within our midst? It's a huge indictment of the continent that up to now very few African leaders have stood up and said, "He doesn't represent us." I think Robert Mugabe's behavior is an indictment of African people and of black people everywhere. He is a huge embarrassment for us. But if you look at the first 10 years of Mugabe showing us what he could do, you can't deny that he invested in his people. In terms of education and health system, there's no comparison. Now what he's doing is trashing that system. We in South Africa need to stand up and say we stand for something, we stand for human rights, dignity, civilization, and say it's not right to kill people, to shed blood to make a point. So what is happening in Zimbabwe is a lesson for the continent. The lesson is that it's important to be a principled people. As Africans, when we see a wrong, we must stand up and say, "That's not right." Unfortunately, we haven't done that with Zimbabwe. Africa must create a democratic space where ideas compete and the best idea wins the day. This interview between Alexis Bloom and Trevor Ncube took place in February 2006 in Johannesburg. Trevor Ncube is a prominent Zimbabwean newspaper publisher living in Johannesburg. He bought the Mail & Guardian, a South African newspaper, in 2002. He also publishes Zimbabwe's last two independent newspapers. All three publications have heavily criticized President Robert Mugabe's government. In December 2005, Mugabe drew up a list of government critics and announced that those who "go around demonizing the country" would have their passports seized. Ncube was the first victim of the crackdown. In this interview, he talks about "the passport incident" and describes what he calls "the tyranny" of Mugabe's regime -- from the conditions endured by reporters to the state control of the legislature. Ncube also offers an explanation for South Africa's muted response to Zimbabwe's crisis and for why he and others are saying that the situation in Zimbabwe today is worse than it was under Prime Minister Ian Smith's white-minority regime. 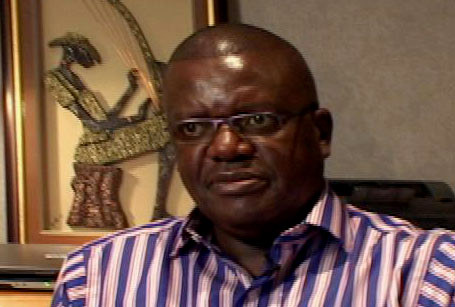 Trevor Ncube is a prominent Zimbabwean newspaper publisher living in Johannesburg. Margaret Dongo, one of Zimbabwe's most famous freedom fighters, took up arms at the age of 15 in the chimurenga (or liberation war) against colonial rule. Khethani Sibanda is a former opposition activist with the Movement for Democratic Change (MDC). Sazini Mpofu is a former Movement for Democratic Change (MDC) opposition activist who worked with fellow member Khethani Sibanda. Prominent human rights lawyer Beatrice Mtetwa has spent years defending Zimbabwean journalists, many of whom have been arrested for their work.